Nitra is a city in western Slovakia, situated at the foot of Zobor Mountain in the valley of the river Nitra. 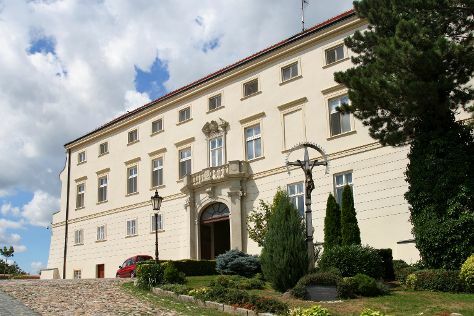 Kick off your visit on the 17th (Fri): get lost in a book at Chateau Appony, explore the historical opulence of Nitra Castle, then stroll through Park na Sihoti, and finally don't miss a visit to Nitra Calvary. Here are some ideas for day two: test your team's savvy at popular escape rooms, take in the architecture and atmosphere at Church of St. Helena, don't miss a visit to Malá synagóga - Gallery, then take in the architecture and atmosphere at St. John the Baptist Cathedral, and finally take in the architecture and atmosphere at Church of St. Michael the Archangel. To see more things to do, ratings, traveler tips, and other tourist information, use the Nitra travel guide. Use the Route module to find suitable travel options from Taviano, Italy to Nitra. Expect little chillier temperatures when traveling from Taviano in June; daily highs in Nitra reach 29°C and lows reach 17°C. Finish your sightseeing early on the 18th (Sat) to allow enough time to travel back home.